When was the last time you looked at your content? Like really looked at it? Do you know what content you have and how it’s performing? Do you understand its strengths and weaknesses? That’s a lot of questions to digest, I know. But you need the answers. Why? A lot of us are focused on our new content that we forget about what we already have. That’s why it’s important for marketers to run regular content audits. No one recognizes this more than Allee Creative’s Melissa Harrison. As CEO, she ensures the content her team produces engages audiences and achieves client goals. 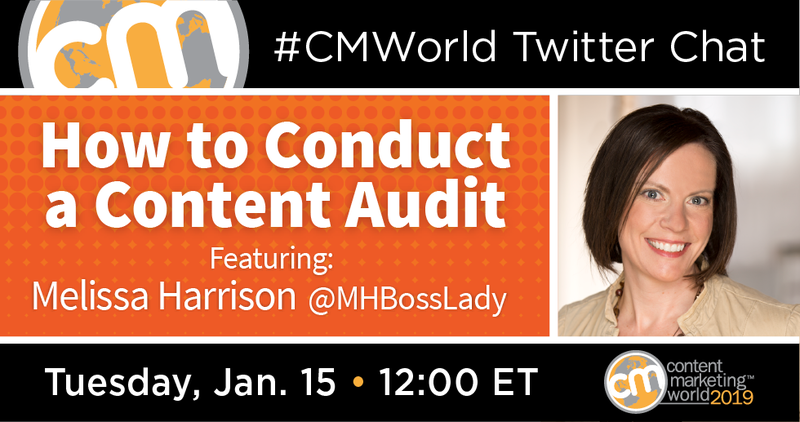 We knew her experience made her the perfect guest for this week’s #CMWorld Twitter chat. Think you don’t have the time or energy to conduct a content audit? Think again. Here, we’ll talk about how to identify and analyze existing content to boost your content marketing strategy. If you want to read more of Melissa’s (and our community’s) insights, our Twitter Moment includes all seven questions and their responses. When should marketers perform a content audit? And how often should it be done? A1. Since I’m a freelancer… I should do a #content audit every time I land a new client. It’s better to have a process that tracks everything as you go and make continual data-driven adjustments. What are some common mistakes people make when conducting a content audit? How can these be avoided? When was the last time you ran a content audit? What did you find? Let us know in the comments below. Want to take your content marketing strategy to the next level? Then you’ll want to meet us in San Diego for ContentTECH Summit. You’ll gain valuable insights into how you can create a more effective process. Register now to secure Early Bird rates AND get an extra $100 off when you use code SM100 at checkout.